As part of the PW Sat Ground Station Project developed by SoftwareMill for Warsaw University of Technology and its Students’ Space Association, me and my colleague (Tomasz Łuczak) were assigned a task to write a software for satellite communication and data collection. We have decided to divide that task into two separate modules, one for data exchange with soundmodem software and the other one for data collection, statistics and command creation. 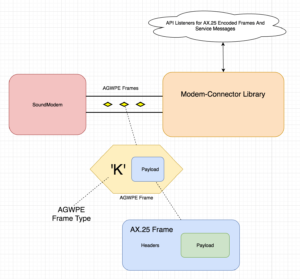 This post is a short description of the first task which result is a software library for exchanging AX.25 frames called modem-connector. You can read more about the PWSat2 project itself on the project website here. The aim of PW-Sat2 – the second satellite designed by members of Students’ Space Association – is to test out a new and innovative technology of satellite’s deorbitation. A team formed of over 30 students from many different faculties of Warsaw University of Technology started working on a new satellite in 2013. PW-Sat2’s launch into orbit is scheduled on the end of 2017. Modem-Connector is a library written in Scala programming language for communicating with modem software (like eg soundmodem UZ7HO SoundModem) through AGWPE connection. This library allows to listen for AX.25 frames received by a soundmodem as well as to send AX.25 frames up. AGWPE protocol allows exchanging data (AGWPE frames) over TCP/IP. In our scenario SoundModem acts as an AGWPE server and our library as a simple client. 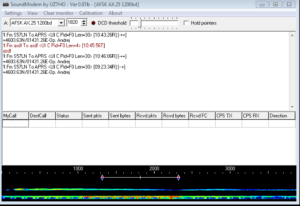 The only data we are interested in are AX.25 frames which after the demodulation on the SoundModem are pushed to our library through TCP/IP. By using specific AGWPE frame we can send AX.25 frame as binary data up to the SoundModem which sends the data through the HAM radio up to the satellite. 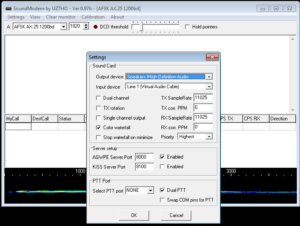 SoundModem is a very popular software solution for modulation and demodulation of multiple binary modes and one of many software solutions to support AGWPE protocol (through emulation). Note that AGWPE acts simply as a KISS TNC, and is not involved in any AX25 level protocol. You can read more about the idea here. In short, Modem-Connector library communicates with SoundModem through AGWPE connection. The soundmodem can be replaced with any AGWPE enabled modem supporting AGWPE protocol. AGWPE communication is implemented using simple JVM Socket mechanism over TCP/IP. AGWPE Frames are sent over the communication channel between the library itself and the AGWPE enabled modem software, specific port and host needs to be provided either through a configuration file, runtime flags or constructor injection. AGWPE frame is characterised by its command type (single lower/upper case letter) and its payload. The library focuses mainly on sending and receiving AX.25 Row data frames and supports only a couple of additional commands. 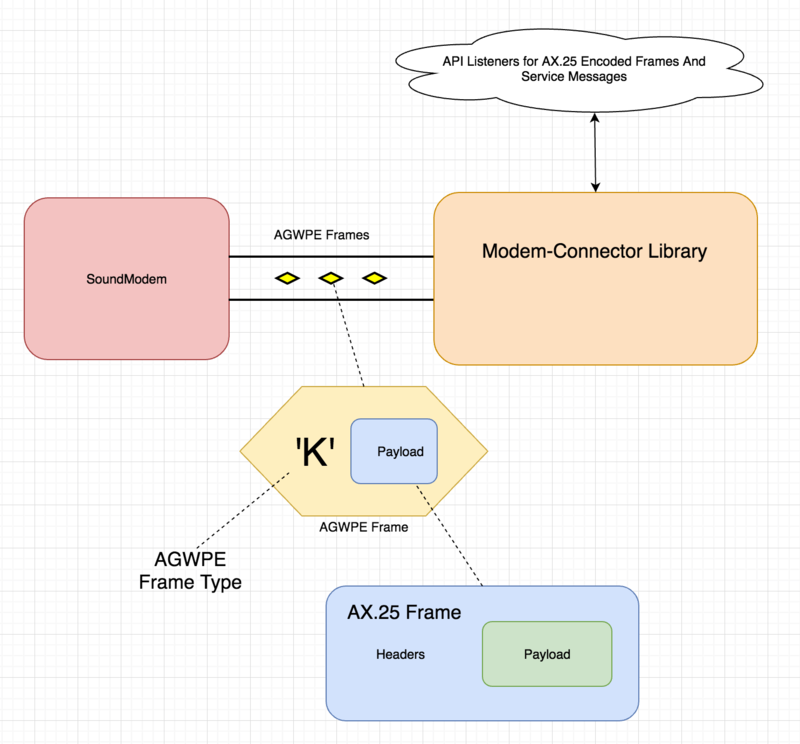 When AX.25 frame is received by the SoundModem, the AGWPE frame is sent over to the Modem-Connector library, the payload of this AGWPE frame is the raw AX.25 frame. The Ax.25 frame gets extracted and it’s passed over to the subscribed listeners. ‘Subject-Observer’ is a scala version of popular observer design pattern, we have subject trait which is responsible for providing a contract to register and notify observers about new events. On the other hand we have a number of Observers implementing Observer trait allowing them to receive data on the client side. Version Service Message is received on library startup when AGWPE Connection is sucessfully established with the SoundModem as well as for keeping the session between the server and the client alive. receive the AX.25 data as well as send and receive version information used to keep the session alive between the modemconnector and the library itself (the keep-alive mechanism is described later in the article). To keep the session alive between the AGWPE server (soundmodem software) and the client (modem-connector library) the simple ‘version’ command is sent periodically. The mechanism incorporates a timer scheduled at a fixed rate. Optional ‘descrambler’ object can be injected to parse the incoming data in case it is scrambled on the satellite radio side. The ‘scrambler’ object itself should be provided by the library client. 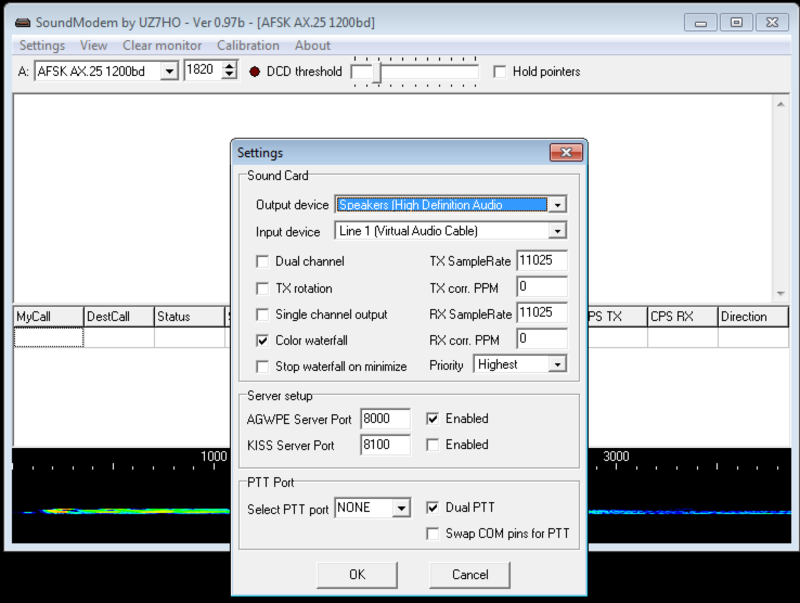 ‘startConnection()’ method is a starting point for soundmodem communication. "com.softwaremill.modem-connector" %% "modem-connector" % "0.1.0-SNAPSHOT"